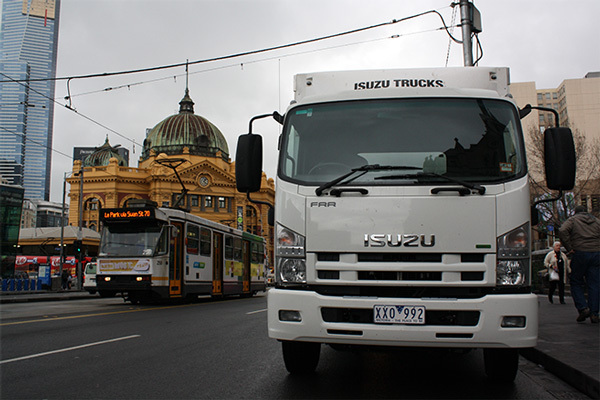 Isuzu Trucks may have brought the FRR 600 into being almost two years ago but that doesn’t stop Matt Wood from settling a score with van couriers in Melbourne’s CBD. The Isuzu FRR600 automated manual transmission (AMT) has been on the market for nearly two years now and judging by the amount of these little jiggers you see scurrying around most capital cities, Isuzu’s popularity is far from being on the wane. This was the first opportunity I’d had to bring myself up to date with Isuzu and also to familiarise myself with the 6-speed AMT box. 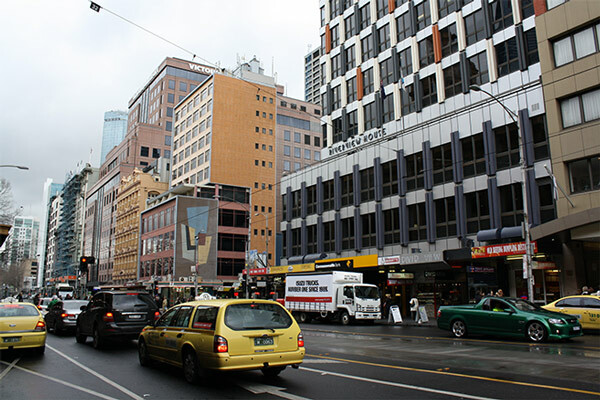 Loaded to a gross weight of 9 tonnes and with the 7.8-litre 235hp engine quietly idling under the cab, I felt the best place to try out the little 600 was in its native habitat — Melbourne’s CBD — at lunch time, on a rainy day; I must have been bonkers. But the evil part of my psyche has a long memory and the daily battles of my youth with courier van drivers have never been forgotten. 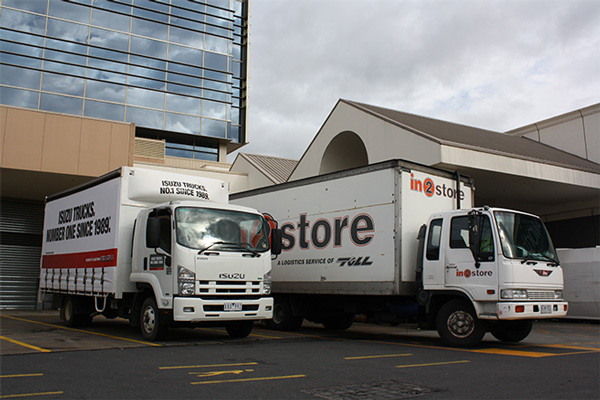 What better way to wreak some revenge but to clog up some of the scarce loading zones of the CBD with the new Isuzu, and take some pictures, and get a coffee, and stand beside the truck drinking my coffee, and wave at frustrated couriers as they circled the block yet again. It may be petty, but it was indeed satisfying. The Sitec 235hp, Euro 5 (ADR 80/03) emissions compliant engine was a little ripper in traffic, pulling away under load easily and providing a deceptive amount of zip when needed. The 7.8-litre powerplant communicated with the self-shifting transmission reasonably well. With a little experimentation I was able use the go pedal to encourage the gear box to shuffle its cogs easily. But, as with most AMTs it’s still easy to get it into a muddle on uneven surfaces like tram tracks and crossing over a road camber. On the whole though, it is still a hell of a lot more civilised than a torque converter auto. Features like Hill Start Assist make life a lot easier eliminating the risk of a slow motion roll back at an intersection, a common cause of grief, especially if there happens to be a Porsche sitting on your back bumper. Looking at the dashboard, column-mounted controls and instrument panel, they are all simple to access and easy to read. Rather than get too clever with their gizmos and gadgets, Isuzu have stuck with a pragmatic simplicity in their approach to their cabs and interiors. Centre stage on the dash board has a Navteq-equipped multimedia audio unit with Bluetooth, SD card. Yep it’s the same unit that UD use, and even Hino, but the large screen of these units is great, easy to read and in the case of the tautliner bodied FRR 600 that I was steering, the reversing camera display on the head unit was fantastic. How else was I going to squeeze into those loading zones? But for all of the technology featured in the multimedia unit, the instrument panel itself features refreshingly easy to read analogue gauges taking care of coolant temperature, fuel level, speedo, and tacho. 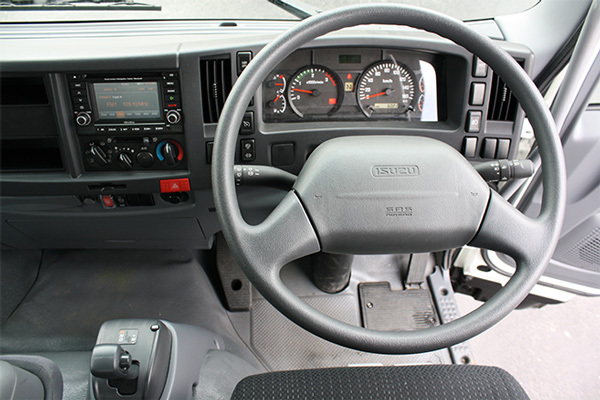 The same goes for the steering column-mounted multi-function switches, with windscreen wipers, indicators, hazard lights, headlights and cruise control all available without having to remove a hand far from the steering wheel. There’s also a driver’s air bag lurking inside the steering wheel. Selecting D on the Isuzu’s gear selector, I idled gently away from Isuzu’s Port Melbourne office, as the Isuzu’s AMT slotted through the appropriate gear changes. Whilst Japanese trucks have never been renowned for being brimming with character, the FRR felt pretty much the same as the old FSR 550 I used to drive all those moons ago; in a nutshell, easy. Probably one of the best characteristics of Isuzu’s light trucks, and for that matter, a lot of their Japanese counterparts, is that virtually anyone can just hop in and drive them. Once I get into the thick of things traffic-wise, I start to appreciate the deep forward sloping cut outs on the passenger and driver’s side windows, providing ample visibility and minimising any blind spots. The wide mirrors with simple plastic housings also give a nice wide view down both sides of the truck. Vehicles of this size tend to earn their keep in urban delivery roles so all of these features combine to make it a lot easier to see where potential obstacles may be lurking. This proved to be handy when occupying a loading zone on Melbourne’s busy Flinders Street, where I’m able to keep an eye on the shop awnings when parking without removing any of the fancy sign writing from either the shops or the trucks body. To really get into the urban delivery groove I was tempted to see whether I could indeed devour a whole bucket of KFC whist deftly piloting the little rigid van out of the CBD and on to Chadstone shopping centre, but I got the guilt’s about returning a vehicle with an interior coated in chicken fat. The loading docks and car park of a Westfield shopping centre should be included on the test circuit of any delivery vehicle, requiring more nerve, sheer audacity, and skill than a hot lap in a V8 super car. In fact I’d like to see Chadstone shopping centre included in the touring car season. But, one of the things I like most about shopping centre deliveries is the universal sign language that manages to cross ethnic divides and goes with the territory. There’s the; both hands, palm up gesture that roughly translates into ‘WTF?’ There’s also the responding shrug that says "bite me". Along with the slow ‘tut tutting’ shake of the head, there’s the popular shaking of the fist and the perennial favourite, the bird. Armed with this linguistic ability I headed underground to block up a loading dock or two. The FRR 600 proved to be in its element, easily manoeuvred with 4.1 turns of the wheel lock to lock, it made short work of jumping queues and backing onto dark, tight dock areas. It was possible to navigate around the massive site confidently, and the ample area of glass out in front made it easier to use my repertoire of sign language to get the point across. Heading back on the freeway gave me the opportunity to get a feel for the FRR600 at highway speed. The Isuzu has a tight feel to the cab and was surprisingly quiet, without much intrusion from either wind or driveline noise. The free revving motor seemed nearly as much at home on the open road as around town, but the addition of a decent cross wind may have changed that impression. The narrow track of these vehicles with a van or tautliner body can make them a bit of handful on a windy highway. With the technology available these days there’s very little excuse for a lack of decent braking capability, and the air over hydraulic system in the FRR proved effective, although as per usual the exhaust brake was pretty much there in name only. On speaking to one FRR operator there were some issues raised about the diesel particulate filter (DPF) regeneration cycle of the Euro 5 engine. These issues revolved more around a lack of driver education on the regeneration process than any major shortcomings on the vehicles part. But two of the company’s vehicles had to be towed to a workshop after they went into limp mode after the drivers ignored the regen prompts. In fact, on talking to a couple of drivers, there seemed to be a common lack of awareness about the regeneration cycle and what part they had to play in it. Considering these vehicles were running refrigeration units powered by the truck engine, which, as a consequence meant a lot of idle time, the DPF was working overtime. As the technology in these vehicles increases it seems that driver education and familiarisation will become more and more important. The FRR 600 was a great little truck for running around town, manoeuvrable, great visibility and enough grunt to get out of its own way. The low cab made jumping in and out of the vehicle easy with plenty of grab handles. The ISRI seat was probably the best I’ve come across in a vehicle of this size with no ‘numb bum’ after a couple of hours in the driver’s seat. The AMT worked well, dealing with the rigour of city traffic easily and leaving me free to take care of more important things, like eating chicken. There’s plenty of storage in the overhead compartments, with a snap shut mechanism to make sure they don’t sit ajar, resulting in an avalanche of pens, paperwork and fast food wrappers. As with most in its class, the FRR cab has a place for everything, a third flip up seat ticks the box for removalists and civil contractors, and there’s room behind the seats for the adventurous to snooze when required. After spending a few hours with the FRR600, it’s easy to see why Isuzu are the market leaders. Self-shutting overhead lockers, no more airborne surprises. Why are all Jap trucks white with grey interiors?